"The Curriculum Hub" is dedicated to sharing resources, ideas, and approaches designed to support and encourage educators. 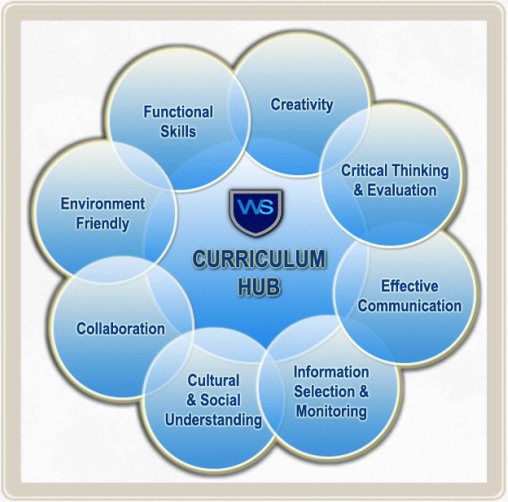 The core mission of Curriculum Hub is to enhance the quality of education through the creation of curriculum tools, resources, products, and services designed to accelerate learning through creativity, innovation, sharing contents and 21st century educational contexts. Moving a head through extended learning with the national curriculum as the benchmark will be the added support to the teachers in enabling creative teaching / learning environment to meet the learning needs of our students. Making the job of the teacher a little bit easier . . . Although ideas about digital media and learning have become an important area for educational research, little attention has been given to the practical and conceptual implications for the school curriculum. A series of contemporary curriculum innovations reflect the social and technological changes of the digital age. Arguing that the curriculum is always both forward and rearward looking, How each of these innovations represents a certain way of understanding the past while also promoting a particular vision of the future. The curriculum initiatives are all examples of what is called “centrifugal schooling,” expressing a vision of education and learning that is decentered, distributed, and dispersed, emphasising networks and connections. In centrifugal schooling, a curriculum is actively assembled and improvised from a heterogeneous mix of people, groups, coalitions, and institutional structures. Participants in curriculum design and planning include local governments, corporations, foundations, charities, and nongovernmental organizations. The Partnership for 21st Century Skills, which advocates “21st century readiness” for students; and the Whole Education Alliance with a network of “third sector” educational organizations. GEMS, Global Education Management Systems, provide management services that optimize academic performance and educational efficiency of private schools. GEMS schools provide educational programs aimed at attaining high standards of educational excellence. Four distinct Core Values are part of the educational programs in all GEMS schools. Global Citizenship, Growing by Learning, Pursuing Excellence and Leading through Innovation, which emphasizes Information and Communication Technology (ICT). b) Continue the overall development of The Westminster School. A GEMS school provides the assurance of all-round, high quality education, success-proven methods, quality practices and a friendly and stimulating learning environment where students are given opportunity to realize their full potential. All Copyrights reserved to The Westminster School, Dubai. The Westminster School Curriculum Hub © 2014.